I’m revisiting this post because of the interest you shared after yesterday’s blog post on keeping the meal table sane when you have littles at home. How do I do the life giving table thing when my kitchen table is piled with school books and papers all day long?! 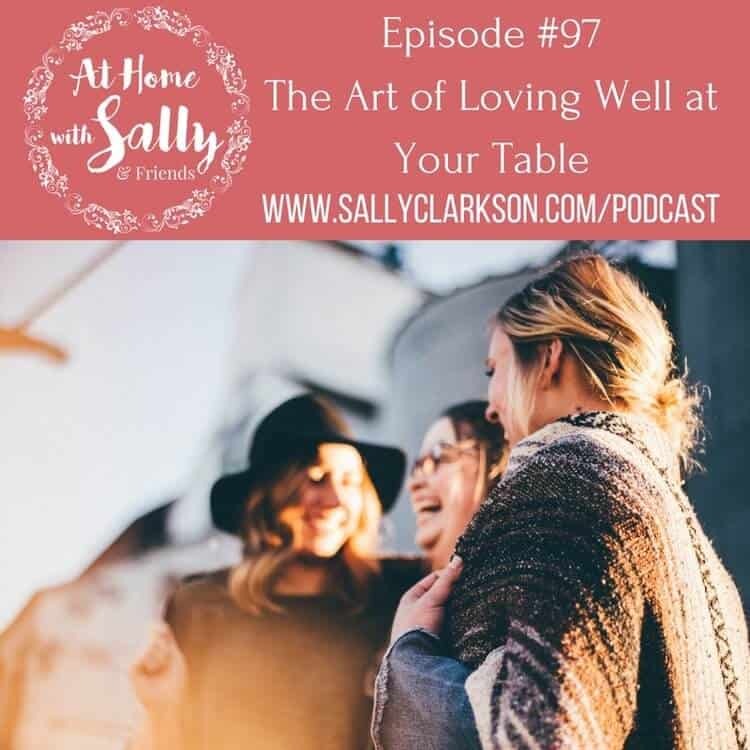 “I’ve been listening to Sally Clarkson’s podcasts and am anxiously waiting for her new book… I’ve been thinking about decorating my table, but always wonder how that will work with homeschooling. I’m going to answer these questions with a virtual tour of my home. There are two videos in this post, as well as quite a few unstaged photos of our family’s home. I hope what you find here will encourage and inspire you in this daily journey of living and loving well… even in the middle of the messes of daily life! And now I’ll tackle these questions one-by-one! Our dining room table isn’t the only place where my kids do school work. As I showed in the video, we also have a school area and table, as well as a desk, in our living room. It isn’t unusual for my kids to perch at the kitchen island to work on a craft, eat, or do school work. 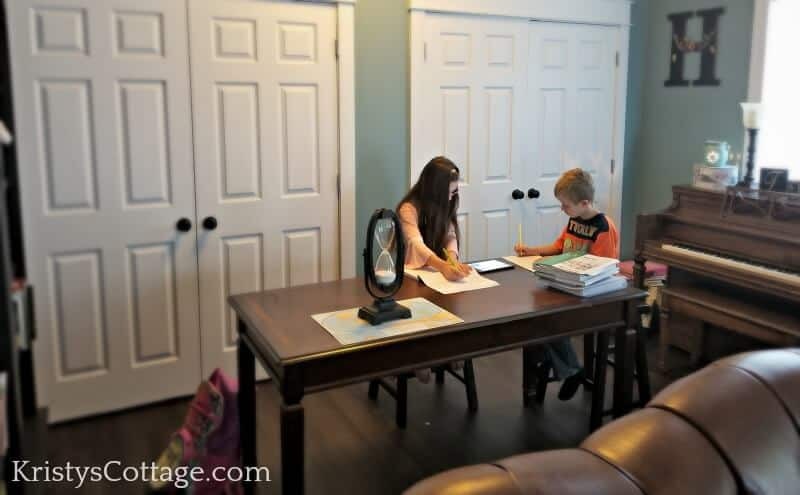 We’re blessed to have a bit of wiggle room for our kids to spread out with their school work, but our dining room table definitely gets used a lot as a school room! 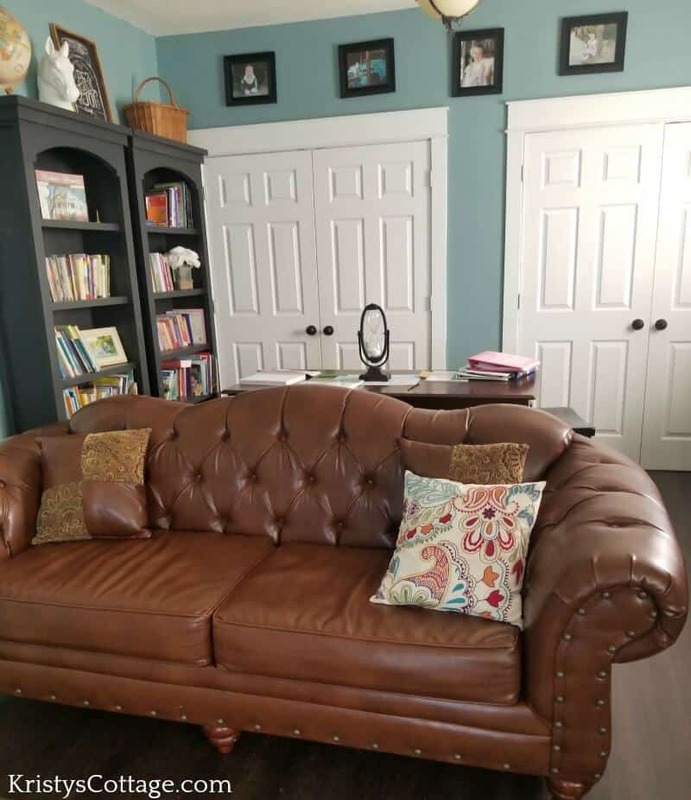 We are blessed with some extra space for a “school area” in our living room… including two large closets for storing school stuff! A closer peek at our school area, table, and book shelves. Two of my kiddos busy doing school work earlier today. I’m a pretty big minimalist. If I had to undo and redo everything on a daily basis, well, I wouldn’t do it! 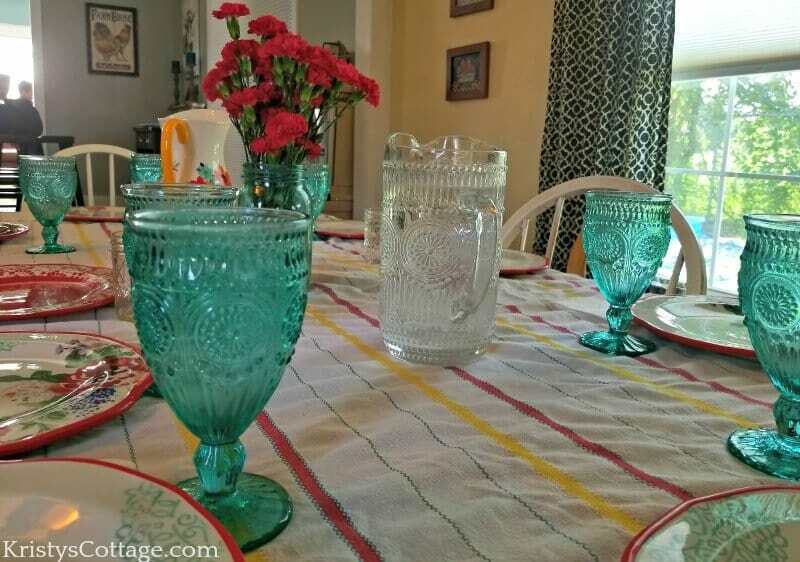 I want my table to look beautiful and inviting, but I don’t want to live so stressed over the details that I don’t enjoy my home, my kids, or schoolwork! 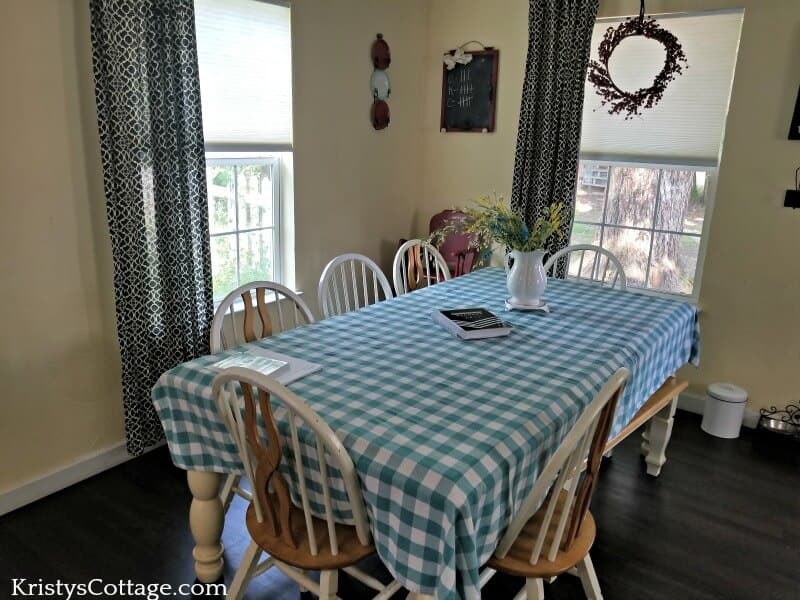 I have a collection of inexpensive table clothes, and I rotate those as needed so that we always sit down to a fresh table cloth. When the table cloth is dirty, my kids know that putting the soiled one in the wash and getting out a fresh one is part of the kitchen duty for that meal. My dining room table as it stands most days. A nice evening dinner or Sunday lunch! We are generally finished with school work by lunch time. There are occassional exceptions, but not many. We hit the books at 8:30 a.m. and wrap it up by 12:30 or 1:00. I’ve always been a stickler about this schedule, and it consistently helps our lives run much more smoothly than if we were stuck in school mode all day. My kids keep their school stuff in a back pack. We don’t usually have books and papers all over the place after school work is done because my kids each have a back pack for their stuff, and the back packs go in the closet before lunch. This is a habit we’ve developed over the years, and it saves us all a lot of clutter and confusion. I’m tidy, but I’m not the most organized mom in the world. Generally speaking, our life runs well in rhythms. The days when we’re all out of sorts and off track? Well, we know that tomorrow is a always a fresh start! You can preorder Sally’s book, The Life Giving Table, at Amazon.com. So how about you? What does your dining room table look like right now? Do you set up a classroom there most every morning, like I do? 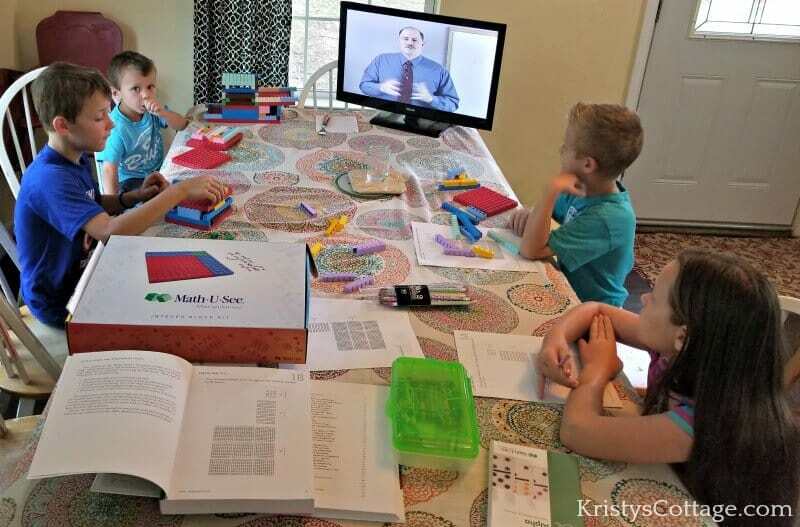 Are you a homeschooling mom? 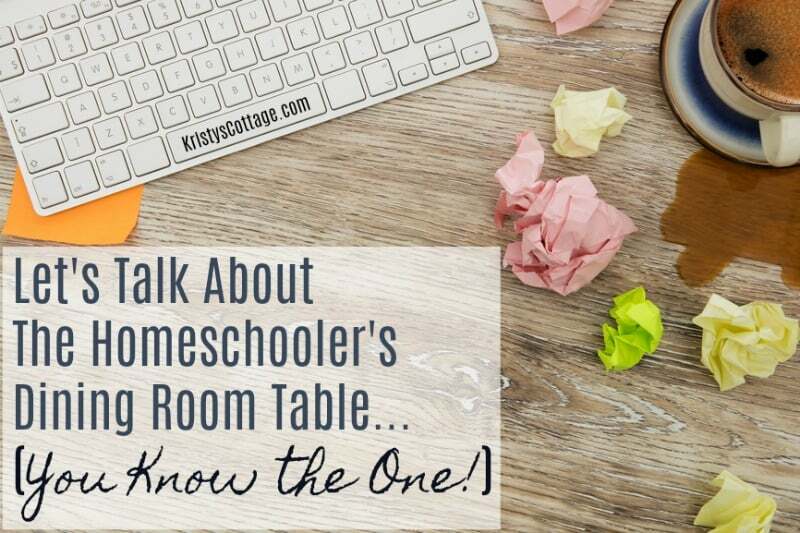 I’d love to connect with you over in my homeschool Facebook group! You can check out my other homeschooling articles HERE. Sometimes I Don’t Want to Homeschool! Ahhh we just picked up some freebie cast-off desks from the local high school (yay for getting a little something in return for our yearly school tax payment, right?) and the idealistic side of me says “wonderful work stations for our boys while we’re schooling” and the practical side remembers my own homeschool days, and the desks my parents picked up at a school auction for us kids, and how we invariably ended up with our school books all sprawled out over the dining room table. They want to be where it’s cozy and inviting, and when younger, where mom is close at hand. By the way – your dining room does look very cozy and inviting. What a great feeling to get a house project done like that! I like the black floor – is it stained or painted wood? Curious because we have a small house full of wooden floors for which we’re not entirely settled on our refinishing plan. Hi Priscilla! 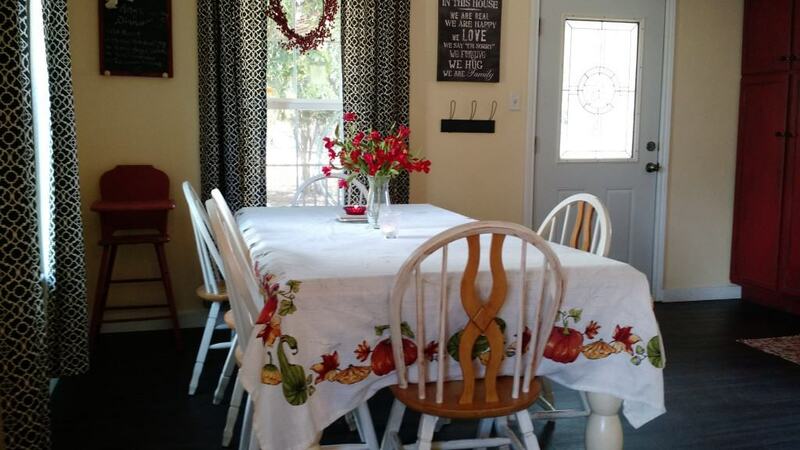 The dining room floors are actually a vinyl laminate wood flooring that my husband put in. This part of the house (the dining room) was originally a porch (off the kitchen), and the original floor was concrete, covered in linoleum. Jeremy pulled up the very old, stained linoleum and replaced it with the wood floors. Our plan is to eventually use this floor in the rest of the house. So far, we have put it down in one of our bathrooms as well, and we absolutely love it! It wears well and is water resistant, a definite MUST when you have little ones! Nice dining room! I love the natural light. 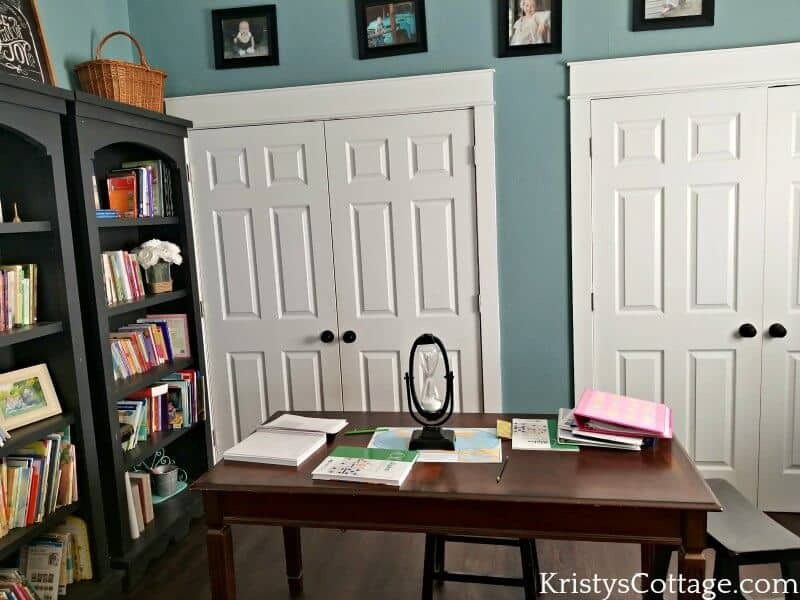 We have a homeschool room, but it’s in the basement. Sometimes we’ll go upstairs for a change of scenery, but it’s so much trouble to carry books & supplies everywhere that I save it for a special treat. PS – Just because I have a room devoted to schooling doesn’t mean it’s any less cluttered during the course of our school day!